Jack Brabham notched up his second successive victory in the Belgian Grand Prix at Spa, but it was the death of two of Britain's most talented young drivers that will be remembered on one of Formula One's darkest days. Chris Bristow, driving a Cooper, and Lotus's Alan Stacey both suffered fatal accidents within minutes of each other. The weekend got off to a bad start when Stirling Moss crashed spectacularly in practice the day before. Travelling at 140mph down the winding, downhill stretch leading to Malmedy, the left rear wheel of his Lotus came off, sending the car into a spin. It veered across the road before slamming into a grass verge, the impact throwing Moss out, leaving him badly injured and unconscious in the middle of the track. Brabham was following behind and stopped to help, deciding, wisely as it turned out, to not give Moss artificial respiration, in case he had broken his ribs. His subsequent diary entry said it all: '18 June, 1960: Shunt. Back. Legs. Nose. Bruises. Bugger.' Moss was taken to hospital in an ambulance, where he was found to have several fractured ribs, three compacted vertebrae, a broken nose, fractured tibia in both legs and severe cuts and bruises. He was lucky to be alive. Later that day, privateer Mike Taylor crashed his Lotus when the steering column snapped. He was found trapped in the car with serious head and neck injuries, but also lived to tell the tale. There was considerable doubt as to whether the Lotus team would actually race on the Sunday, but when new parts arrived by charter plane from the UK, Jim Clark and Stacey took their places on the grid. 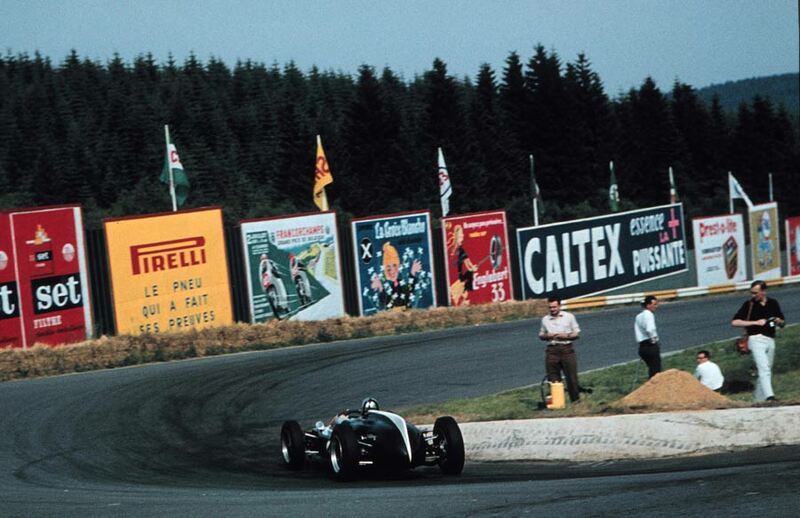 Brabham led from the start, with Phil Hill close behind in his Ferrari. Tragedy struck on the 19th lap when Bristow crashed barely a hundred yards from where Moss had come to grief the previous day. He was catapulted from his Cooper, hit a wire fence and died instantly. Just five laps later, Stacey also lost his life when his Lotus crashed and caught fire, reportedly after the young driver had been hit in the face by a bird. A particularly gruelling and brutal race came to an end when Phil Hill was forced to make a pit stop for a broken fuel line, allowing Brabham to coast home well ahead of team-mate Bruce McLaren. Clark scored his first championship points, coming in fifth. Bringing the death toll of British drivers to eight in the past two years, once again the safety of Formula One was questioned, with fears that the modern, light cars were too quick on the high speed circuits. But, as Moss said, when told of the deaths after the race: "It is difficult to have an accident here without it being serious. This is one of the fastest tracks in the world. That is what makes it so dangerous."